Here is something cool about risotto with saffron–it has THE SPICE. Saffron has always been considered an ingredient with medical benefits. It was used to cure colds, coughs and even scarlet fever and something you might not know is that it wasn’t always used as foot. As a matter of fact, it started out as a clothes’ dyier, as a single grain could color 10 colors of water. The number of used grains for dyeing depended on the color you wanted to obtain (red, orange, yellow). Later on, it began being used as a spice, having a distinctive flavor. It’s not a particularly cheap one, because cultivating and harvesting it is still manual labor–a tradition which has been kept for all these years. On the positive side, saffron can be preserved for years, as long as the container is kept under normal temperatures. Saffron’s nutrition facts will blow your mind. It has huge manganese content, which is 4 times more than the daily recommended values. This means it’s pretty much impossible to eat more than just a few grams of saffron in one go. It’s hard for anything else to top it, but also the rest of the nutrients are quite impressive, including vitamin C, iron and magnesium. In a saucepan, fry in butter, add the chopped onion and cook for a few minutes. Add the white wine and let it evaporate so that the alcoholic part evaporates and the acid part remains. Filter in a strainer to remove the remains of the onion, add the creamed butter. In another casserole, toast Carnaroli rice in a little butter for a couple of minutes. Sprinkle a little white wine, let it evaporate. Pour the clear broth and add the saffron threads. Bake for about 18 minutes. After the cooking, stir in Parmesan and butter acid obtained previously. 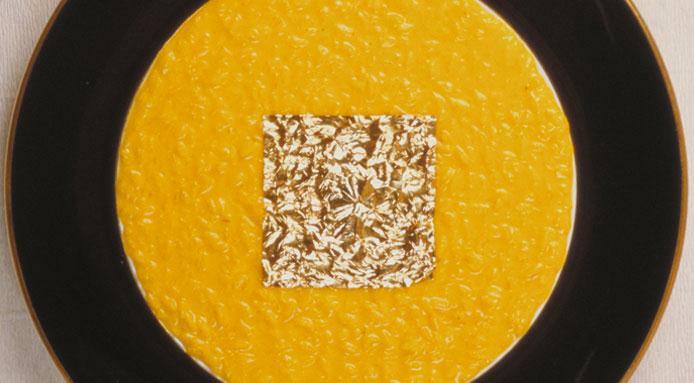 Arrange the risotto in the dishes and place one on each edible gold leaf. Risotto with saffron is all I need because of the health benefits I can get. I kept asking my mom to make me this and I will not mind if she serves me this every other day. Thank you nonna box for giving out the recipe. Wow Look nice !!! 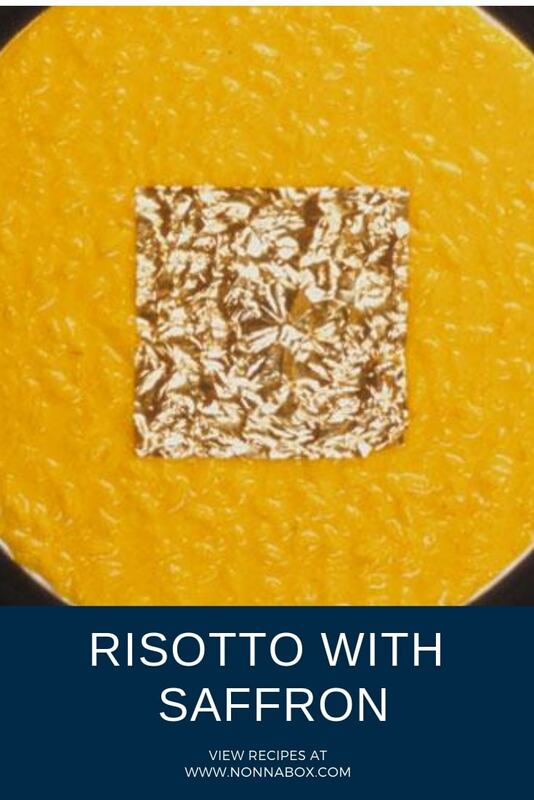 With the golden leave on top as the great Italian chef Gualtiero Marchesi did it. Good job !!! Wich kind of saffron do you use in this recipe?